This article is about the academic treatment of the Bible as a historical document. For criticisms made against the Bible as a source of reliable information or ethical guidance, see Criticism of the Bible. Biblical criticism is an umbrella term for those methods of studying the Bible that embrace two distinctive perspectives: the concern to avoid dogma and bias by applying a non-sectarian, reason-based judgment, and the reconstruction of history according to contemporary understanding. Biblical criticism uses the grammar, structure, development, and relationship of language to identify such characteristics as the Bible's literary structure, its genre, its context, meaning, authorship, and origins. Biblical criticism includes a wide range of approaches and questions within four major contemporary methodologies: textual, source, form, and literary criticism. Textual criticism examines the text and its manuscripts to identify what the original text would have said. Source criticism searches the texts for evidence of original sources. Form criticism identifies short units of text and seeks to identify their original setting. Each of these is primarily historical and pre-compositional in its concerns. Literary criticism, on the other hand, focuses on the literary structure, authorial purpose, and reader's response to the text through methods such as rhetorical criticism, canonical criticism, and narrative criticism. Biblical criticism began as an aspect of the rise of modern culture in the West. Some scholars claim that its roots reach back to the Reformation, but most agree it grew out of the German Enlightenment. German pietism played a role in its development, as did British deism, with its greatest influences being rationalism and Protestant scholarship. The Enlightenment age and its skepticism of biblical and ecclesiastical authority ignited questions concerning the historical basis for the man Jesus separately from traditional theological views concerning him. This "quest" for the Jesus of history began in biblical criticism's earliest stages, reappeared in the nineteenth century, and again in the twentieth, remaining a major occupation of biblical criticism, on and off, for over 200 years. In the late twentieth and early twenty-first century, biblical criticism was influenced by a wide range of additional academic disciplines and theoretical perspectives, changing it from a primarily historical approach to a multidisciplinary field. In a field long dominated by white male Protestants, non-white scholars, women, and those from the Jewish and Catholic traditions became prominent voices. Globalization brought a broader spectrum of worldviews into the field, and other academic disciplines as diverse as Near Eastern studies, psychology, anthropology and sociology formed new methods of biblical criticism such as socio-scientific criticism and psychological biblical criticism. Meanwhile, post-modernism and post-critical interpretation began questioning biblical criticism's role and function. German pietism played a role in the rise of biblical criticism by supporting the desire to break the hold of religious authority. :6:19 Rationalism was also a significant influence in biblical criticism's development, providing its concern to avoid dogma and bias through reason. :42,252 For example, the Swiss theologian Jean Alphonse Turretin (1671–1737) attacked conventional exegesis (interpretation) and argued for critical analysis led solely by reason. Turretin believed the Bible could be considered authoritative even if it was not considered inerrant. This has become a common modern Judeo-Christian view. :39–42 Johann Salomo Semler (1725–1791) argued for an end to all doctrinal assumptions, giving historical criticism its non-sectarian nature. As a result, Semler is often called the father of historical-critical research. :43 Semler distinguished between "inward" and "outward" religion, the idea that, for some people, their religion is their highest inner purpose, while for others, religion is a more exterior practice: a tool to accomplish other purposes more important to the individual such as political or economic goals. This is a concept recognized by modern psychology. After 1970, biblical criticism began to change radically and pervasively. :21 New criticism (literary criticism) developed. New historicism, a literary theory that views history through literature, also developed. :51,52,60 Biblical criticism began to apply new literary approaches such as structuralism and rhetorical criticism, which were less concerned with history and more concerned with the texts themselves. :296 In the 1970s, the New Testament scholar E. P. Sanders advanced the New Perspective on Paul, which has greatly influenced scholarly views on the relationship between Pauline Christianity and Jewish Christianity in the Pauline epistles. :69–92,260:xviii-xxi Sanders also advanced study of the historical Jesus by putting Jesus' life in the context of first-century Second Temple Judaism. :13–18 In 1974, the theologian Hans Frei published The Eclipse of Biblical Narrative, which became a landmark work leading to the development of post-critical biblical interpretation. :13 The third period of focused study on the historical Jesus began in 1985 with the Jesus Seminar. The Rylands fragment: P52 verso. Oldest existing fragment of New Testament Papyrus; contains phrases from the Book of John. Statue of Northrop Frye, an important figure in biblical criticism, on a bench in Toronto. William Robertson Smith was a Scottish orientalist and conservative minister of the Free Church of Scotland who supported biblical criticism in its early days. At first, biblical historical criticism and its deductions and implications were so unpopular outside liberal Protestant scholarship it created a schism in Protestantism. The American fundamentalist movement of the 1920s and 1930s began, at least partly, as a response to nineteenth century liberalism. Some fundamentalists believed liberal critics had invented an entirely new religion "completely at odds with the Christian faith". However, there were also conservative Protestants who accepted it. William Robertson Smith (1846–1894) is an example of a nineteenth century evangelical who believed historical criticism was a legitimate outgrowth of the Protestant Reformation's focus on the biblical text. He saw it as a "necessary tool to enable intelligent churchgoers" to understand the Bible, and was a pioneer in establishing the final form of the supplementary hypothesis of the documentary hypothesis. A similar view was later advocated by the Primitive Methodist biblical scholar A. S. Peake (1865–1929). :298 Other evangelical Protestant scholars such as Edwin M. Yamauchi, Paul R. House, and Daniel B. Wallace have continued the tradition of conservatives contributing to critical scholarship. M.-J. Lagrange was instrumental in helping Catholicism accept biblical criticism. Mordechai Breuer was a prominent Jewish critical scholar. ^ Anthony Campbell says, "... form criticism has a future if its past is allowed a decent burial; form criticism has been relegated now from its high status in the past: it no longer attracts scholars"; Erhard Blum observes problems, and he wonders if one can speak of a current form-critical method at all; Thomas Römer raises the question of the validity of Sitz im Leben; "Such is the question asked by Won Lee: one wonders whether Gunkel's form criticism is still viable today." ^ Muller, Richard (1998). "Biblical Interpretation in the Sixteenth and Seventeenth Centuries". In McKim, Donald K. (ed.). Historical Handbook of Major Biblical Interpreters. Downers Grove, Illinois: InterVarsity Press. ISBN 978-0-8308-1452-7. ^ Young, Edward Joseph (1989) . An Introduction to the Old Testament. Grand Rapids, Michigan: Eerdmans Pub. Co. ISBN 978-0-8028-0339-9. ^ a b c Nahkola, Aulikki (2007). "The Memoires of Moses and the Genesis of Method in Biblical Criticism: Astruc's Contribution". In Jarick, John (ed.). Sacred Conjectures: The Context and Legacy of Robert Lowth and Jean Astruc. New York: T&T Clark. ISBN 978-0-567-02932-4. ^ a b Reill, Peter Hanns (1975). The German Enlightenment and the Rise of Historicism. Berkeley: University of California Press. ISBN 978-0-520-02594-3. ^ a b c d e f g h i j k l m n Law, David R. (2012). The Historical-Critical Method: A Guide for the Perplexed. New York: T&T Clark. ISBN 978-0-56740-012-3. ^ a b c d e f g h i j Soulen, Richard N.; Soulen, R. Kendall (2001). Handbook of Biblical Criticism (Third ed.). Lexington, Kentucky: Westminster John Knox Press. ISBN 978-0-664-22314-4. ^ Behere, Prakash B.; Das, Anweshak; Yadav, Richa; Behere, Aniruddh P. (2013). "Religion and mental health". Indian Journal of Psychiatry. 55 (Suppl 2): S187–S194. doi:10.4103/0019-5545.105526. PMC 3705681. PMID 23858253. ^ Herrick, James A. (1997). The Radical Rhetoric of the English Deists: The Discourse of Skepticism, 1680–1750. Columbia, South Carolina: University of South Carolina Press. ISBN 978-1-57003-166-3. ^ a b c d Rogerson, J. W. (2000). "Higher Criticism". In Hastings, Adrian; Mason, Alistair; Pyper, Hugh (eds.). The Oxford Companion to Christian Thought. New York: Oxford University Press. ISBN 978-0-19-860024-4. ^ Law, David (2000). "German Christian Thought". In Hastings, Adrian; Mason, Alistair; Pyper, Hugh (eds.). The Oxford Companion to Christian Thought. New York: Oxford University Press. ISBN 978-0-19-860024-4. ^ a b Barton, John (2007). The Nature of Biblical Criticism. Louisville, Kentucky: Westminster John Knox Press. ISBN 978-0-664-22587-2. ^ a b Groetsch, Ulrich (2015). Hermann Samuel Reimarus (1694–1768): Classicist, Hebraist, Enlightenment Radical in Disguise. Leiden: Brill. ISBN 978-90-04-27299-6. ^ Brown, Colin (1998). "Reimarus, Hermann Samuel". In McKim, Donald K. (ed.). Historical Handbook of Major Biblical Interpreters. Downer's Grove, Illinois: InterVarsity Press. ISBN 978-0-8308-1452-7. ^ Sheppard, Gerald (1998). "Johann David Michaelis". In McKim, Donald K. (ed.). Historical Handbook of Major Biblical Interpreters. Downer's Grove, Illinois: InterVarsity Press. ISBN 978-0-8308-1452-7. ^ Baird, William (1992). History of New Testament Research: From Deism to Tübingen. 1. Minneapolis, Minnesota: Fortress Press. ISBN 978-0-8006-2626-6. ^ a b Soulen, Richard N.; Soulen, R. Kendall (2001). Handbook of Biblical Criticism (Third ed.). Lexington, Kentucky: Westminster John Knox Press. ISBN 978-0-664-22314-4. ^ Hengel, Martin (2010) . Saint Peter: The Underestimated Apostle. Translated by Thomas Trapp. Grand Rapids, Michigan: Eerdmans. ISBN 978-0-8028-2718-0. ^ Hafemann, S. J. (1998). "Baur, F. C.". In McKim, Donald K. (ed.). Historical Handbook of Major Biblical Interpreters. Downer's Grove, Illinois: InterVarsity Press. ISBN 978-0-8308-1452-7. ^ a b c Sweeney, Marvin A. (1997). "Why Jews Are Interested in Biblical Theology: A Retrospective on the Work of Jon D. Levenson". Jewish Book Annual. 55-56. ^ a b c Gerdmar, Anders (2009). Roots of Theological Anti-Semitism: German Biblical Interpretation and the Jews, from Herder and Semler to Kittel and Bultmann. Leiden, Netherlands: Brill. ISBN 978-90-04-16851-0. ^ Soulen, Richard N.; Soulen, R. Kendall (2001). Handbook of Biblical Criticism (Third ed.). Lexington, Kentucky: Westminster John Knox Press. ISBN 978-0-664-22314-4. ^ Hafemann, S. J. (2007). "Ferdinand Christian Baur". In McKim, David K. (ed.). Dictionary of Biblical Interpreters. Downers Grove, Illinois: IVP Academic. ISBN 978-0-8308-2927-9. ^ Baird, William (2003). History of New Testament Research: From Jonathan Edwards to Rudolf Bultmann. Minneapolis, Minnesota: Ausgburg Fortress. ISBN 978-0-8006-2627-3. ^ Morgan, R. (1998). "Strauss, David Friedrich". In McKim, Donald K. (ed.). Historical Handbook of Major Biblical Interpreters. Downer's Grove, Illinois: InterVarsity Press. ISBN 978-0-8308-1452-7. ^ Holmberg, Bengt (2011). "Futures for the Jesus Quest". In Holmén, Tom; Porter, Stanley (eds.). Handbook for the Study of the Historical Jesus (4 Vols). Boston, Massachusettes: Brill. ISBN 978-9-00416-372-0. ^ Rollmann, H. (2007). "Wrede, William". In McKim, Donald K. (ed.). Dictionary of Major Biblical Interpreters. Downer's Grove, Illinois: InterVarsity Press. ISBN 978-0-8308-2927-9. ^ Wardman, Harold W. "Ernest Renan". Encyclopaedia Britannica (Online ed.). Retrieved 11 July 2018. ^ Boring, M. E. (2007). "Weiss, Johannes". In McKim, Donald K. (ed.). Dictionary of Major Biblical Interpreters. Downer's Grove, Illinois: InterVarsity Press. ISBN 978-0-8308-2927-9. ^ Dawes, Gregory W. (2000). Dawes, Gregory W. (ed.). The Historical Jesus Quest: Landmarks in the Search for the Jesus of History. Loiusville, Kentucky: Westminster John Knox. ISBN 978-0-664-22262-8. ^ Weaver, Walter P. (1999). The Historical Jesus in the Twentieth Century: 1900-1950. Harrisburg, Pennsylvania: Trinity Press International. ISBN 978-1-56338-280-2. ^ a b Casey, Maurice (2010). Jesus of Nazareth: An Independent Historian's Account of His Life and Teaching. New York City, New York and London, England: T & T Clark. ISBN 978-0-567-64517-3. ^ Soulen, Richard N; Soulen, R. Kendall (2011). Handbook of Biblical Criticism (Fourth ed.). Louisville, Kentucky: Westminster John Knox Press. ISBN 978-0-664-23534-5. ^ Hammann, Konrad (2012). Rudolf Bultmann: a Biography. Salem, Oregon: Polebridge Press. ISBN 978-1-59815-118-3. ^ Jonas, Hans (2007). "The Concept of God After Auschwitz: A Jewish Voice". In Katz, Steven T.; Biderman, Shlomo; Greenberg, Gershon (eds.). Wrestling with God: Jewish Theological Responses during and after the Holocaust. New York: Oxford University Press. ISBN 978-0-19-530014-7. ^ Perrin, Norman (2002). What is Redaction Criticism?. Eugene, Oregon: Wipf & Stock. ISBN 978-1-57910-545-7. ^ a b c d McKim, Donald K., ed. (1998). Historical Handbook of Major Biblical Interpreters. Downers Grove: IVP Academic. ISBN 978-0-8308-1452-7. ^ Charlesworth, James H. (2006). "The Dead Sea Scrolls: Their Discovery and Challenge to Biblical Studies". In Charlesworth, James H. (ed.). The Bible and the Dead Sea Scrolls: Scripture and the scrolls. Waco, Texas: Baylor University Press. ISBN 978-1-932792-19-5. ^ Sheppard, G. T.; Thiselton, A. C. (2007). "Biblical Interpretation in Europe in the Twentieth Century". In McKim, Donald K. (ed.). Dictionary of Major Biblical Interpreters. Downers Grove, Illinois: IVP Academic. ISBN 978-0-8308-2927-9. ^ Berlin, Adele (2008). "Literary Approaches to Biblical Literature". In Greenspahn, Frederick E. (ed.). The Hebrew Bible: New Insights and Scholarship. New York: New York University Press. ISBN 978-0-8147-3188-8. ^ Bühler, Pierre (2000). "Hermeneutics". In Hastings, Adrian; Mason, Alistair; Pyper, Hugh (eds.). The Oxford Companion to Christian Thought. New York: Oxford University Press. ISBN 978-0-19-860024-4. ^ O'Brien, P.T. (2002). "Justification in Paul and Some Crucial Issues of the Last Two Decades". In Carson, D. A. (ed.). Right With God: Justification in the Bible and the World. Eugene, Oregon: Wipf & Stock. ISBN 978-1-59244-044-3. ^ Beckstrom, Edward A. (2013). Beyond Christian Folk Religion: Re-grafting into Our Roots (Romans 11:17–23). Eugene, Oregon: Resource Publications. ISBN 978-1-62032-884-2. ^ Ochs, Peter (1993). "An Introduction to Post-critical Interpretation". In Ochs, Peter (ed.). The Return to Scripture in Judaism and Christianity: Essays in Postcritical Scriptural Interpretation. Eugene, Oregon: Wipf & Stock. ISBN 978-1-55635-815-9. ^ Miller, Robert J. (1999). The Jesus Seminar and Its Critics. Santa Rosa, California: Polebridge Press. ISBN 978-0-944344-78-1. ^ Fiorenza, Elisabeth Schüssler. (2014). "Between Movement and Academy: Feminist Biblical Studies in the Twentieth Century". In Fiorenza, Elisabeth Schüssler. (ed.). Feminist Biblical Studies in the Twentieth Century: Scholarship and Movement. Atlanta, Georgia: Society of Biblical Literature. ISBN 978-1-58983-583-2. ^ a b McKenzie, Steven L.; Kaltner, John (2007). The Old Testament: Its Background, Growth, & Content. Eugene, Oregon: Wipf & Stock Publishers. ISBN 978-1-62564-264-6. ^ a b c d Bird, Graeme D. (2010). "Textual Criticism as Applied to Classical and Biblical Texts". 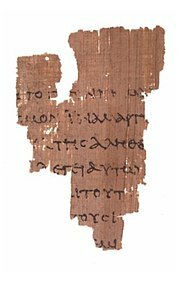 Multitextuality in the Homeric Iliad: The Witness of the Ptolemaic Papyri. Boston: Harvard University. ^ Timothy W. Seid. "Codex". Interpreting Ancient Manuscripts Web. Retrieved 18 October 2018. ^ a b Stewart, Robert B. (2011). "Introduction". In Stewart, Robert B. (ed.). The Reliability of the New Testament: Bart D. Ehrman and Daniel B. Wallace in Dialogue. Minneapolis, Minnesota: Fortress Press. ISBN 978-0-8006-9773-0. ^ Aland, Kurt; Aland, Barbara (1987). The Text of the New Testament: An Introduction to the Critical Editions and to the Theory and Practice of Modern Textual Criticism. Grand Rapids: Eerdmans. ISBN 978-0-8028-3620-5. ^ a b c d e Metzger, B. M.; Ehrman, Bart (2005). The Text of the New Testament (Fourth ed.). New York: Oxford University Press. ISBN 978-0-19-516667-5. ^ a b Wegner, Paul D. (2006). A Student's Guide to Textual Criticism of the Bible: Its History, Methods and Results. Downers Grove: IVP Academic. ISBN 978-0-8308-2731-2. ^ a b Wasserman, Tommy; Gurry, Peter J. (2017). "Introduction". A New Approach to Textual Criticism: An Introduction to the Coherence-Based Genealogical Method. Atlanta: SBL Press. ISBN 978-3-438-05174-5. ^ Clines, David J. A. (1998). On the Way to the Postmodern: Old Testament Essays 1967–1998. 1. Sheffield, England: Sheffield Academic Press. ISBN 978-1-85075-901-0. ^ Tarrant, Richard (2016). Texts, Editors, and Readers: Methods and Problems in Latin Textual Criticism. Cambridge, United Kingdom: Cambridge University Press. ISBN 978-0-521-76657-9. ^ "Lexicon of Scholarly Editing". Lexicon of Scholarly Editing. European Research Council. Retrieved 15 June 2018. ^ Muller, R. A. (2007). "Biblical Interpretation in the Sixteenth and Seventeenth Centuries: The Post-reformation Era". In McKim, Donald K. (ed.). Dictionary of Major Biblical Interpreters. Downers Grove, Ill.: IVP Academic. ISBN 978-0-8308-2927-9. ^ Smend, Rudolf (2007). From Astruc to Zimmerli: Old Testament Scholarship in Three Centuries. Germany: Mohr Siebeck. ISBN 978-3-16-149338-6. ^ Tov, Emanuel (2001). Textual Criticism of the Hebrew Bible (Second Revised ed.). Minneapolis, Minnesota: Fortress Press. ISBN 978-0-80069-664-1. ^ a b c d Campbell, Anthony F.; O'Brien, Mark A. (1993). Sources of the Pentateuch: Texts, Introductions, Annotations. Minneapolis, Minnesota: Fortress Press. ISBN 978-0-80062-701-0. ^ a b c d e f Guthrie, Donald (1990). New Testament Introduction (Master Reference) (Revised ed.). Downers Grove, Illinois: InterVarsity Press. ISBN 978-0-8308-1402-2. ^ a b c d Nicholson, Ernest (2002). The Pentateuch in the Twentieth Century: The Legacy of Julius Wellhausen. New York: Oxford University Press. ISBN 978-0-19-925783-6. ^ Baden, Joel S. (2012). The Composition of the Pentateuch: Renewing the Documentary Hypothesis. New Haven: Yale University Press. ISBN 978-0-300-15263-0. ^ a b Kaltner, John; McKenzie, Steven Linn (2007). The Old Testament: Its Background, Growth, and Content. Eugene, Oregon: Wipf & Stock. ISBN 978-1-62564-264-6. ^ Soulen, Richard N.; Soulen, R. Kendall (2011). Handbook of Biblical criticism. Louisville, Kentucky: Westminster John Knox Press. ISBN 978-0-664-22314-4. ^ a b Viviano, Pauline A. (1999). "Source Criticism". In Haynes, Stephen R.; McKenzie, Steven L. (eds.). To Each Its Own Meaning: An Introduction to Biblical Criticisms and Their Application. Louisville Kentucky: Westminster John Knox Press. ISBN 978-0-664-25784-2. ^ Van Seters, John (2015). The Pentateuch: A Social-Science Commentary (Second ed.). New York: Bloomsbury T & T Clark. ISBN 978-0-56765-879-1. ^ Berman, Joshua A. (2017). Inconsistency in the Torah: Ancient Literary Convention and the Limits of Source Criticism. New York: Oxford University Press. ISBN 978-0-19065-880-9. ^ Wenham, David (1979). "Source Criticism". In Marshall, I. Howard (ed.). New Testament Interpretation: Essays on Principles and Methods (Revised ed.). Carlisle: The Paternoster Press. ISBN 978-0-85364-424-8. ^ Scroggie, William Graham (1995). A Guide to the Gospels. Grand Rapids, Michigan: Kregel Publications. ISBN 978-0-8254-3744-1. ^ Marshall, I. Howard, ed. (1977). New Testament Interpretation: Essays on Principles and Methods. Eugene, Oregon: Wipf & Stock. ISBN 978-1-59752-696-8. ^ a b c Neville, David J. (1994). Arguments from Order in Synoptic Source Criticism: A History and Critique. Macon, Georgia: Mercer University Press. ISBN 978-0-86554-399-7. ^ Elwell, Walter A.; Yarbrough, Robert W. (2013). Encountering the New Testament: A Historical and Theological Survey (Third ed.). Grand Rapids, Michigan: Baker Academic. ISBN 978-1-4412-4476-5. ^ Goodacre, Mark (2002). 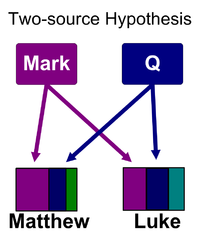 The Case Against Q: Studies in Markan Priority and the Synoptic Problem. Harrisburg, Pennsylvania: Trinity Press International. ISBN 978-1-56338-334-2. ^ a b c d Bauckham, Richard (2006). Jesus and the Eyewitnesses. Grand Rapids, Michigan: Eerdmans. ISBN 978-0-8028-6390-4. ^ a b Miller II, Robert D. (2011). Oral Tradition in Ancient Israel. Eugene, Oregon: Cascade Books. ISBN 978-1-61097-271-0. ^ Mihelic, Joseph (1951). "The Influence of Form Criticism on the Study of the Old Testament". Journal of the American Academy of Religion. 19 (3): 120–129. doi:10.1093/jaarel/XIX.3.120. ^ a b c d e Eddy, Paul Rhodes; Boyd, Gregory A. (2007). The Jesus Legend. Grand Rapids, Michigan: Baker Academic. ISBN 978-0-8010-3114-4. ^ Yeung, Maureen W. (2002). Faith in Jesus and Paul: A Comparison with Special Reference to 'Faith That Can Remove Mountains' and 'Your Faith Has Healed/Saved you'. Germany: Mohr Siebeck Pub. ISBN 978-3-16-147737-9. ^ McKnight, Edgar V. (1997). What is Form Criticism?. Eugene, Oregon: Wipf & Stock. ISBN 978-1-579-10055-1. ^ a b c Knierim, Rolf (2000). "Old Testament Form Criticism Reconsidered". In Kim, Wonil; Ellens, Deborah L.; Floyd, Michael; Sweeney, Marvin A. (eds.). Reading the Hebrew Bible for a New Millennium: Form, Concept, and Theological Perspective. 2. Harrisburg, PA.: Trinity Press. ISBN 978-1-56338-326-7. ^ a b Burridge, Richard A. (2004). What Are the Gospels? : A Comparison with Graeco-Roman Biography (Second ed.). Grand Rapids, Michigan: Eerdmans. ISBN 978-0-8028-0971-1. ^ Hoffman, Yair (2004). Review of Marvin A. Sweeney and Ehud Ben Zvi (eds. ), The Changing Face of Form-Criticism for the Twenty-First Century, ISBN 978-0-8028-6067-5, 2003. Review of Biblical Literature. ^ a b c Sweeney, Marvin Alan; Zvi, Ehud Ben (2003). "Introduction". In Sweeney, Marvin Alan; Zvi, Ehud Ben (eds.). The Changing Face of Form Criticism for the Twenty-first Century. Grand Rapids, Michigan: Eerdmans. ISBN 978-0-8028-6067-5. ^ a b c Kelber, Werner H. (2013). Imprints, Voiceprints, and Footprints of Memory: Collected Essays of Werner H. Kelber. Atlanta: Society of Biblical Literature. ISBN 978-1-58983-894-9. ^ Sparks, Kenton (2007). "Form criticism". In Porter, Stanley E. (ed.). Dictionary of Biblical Criticism and Interpretation. New York: Routledge. ISBN 978-0-415-20100-1. ^ Meier, John P. (2006). "Criteria: How Do We Decide What Comes From Jesus?". In James D. G. Dunn; Scot McKnight (eds.). The Historical Jesus in Recent Research. ISBN 978-1-57506-100-9. ^ Sanders, E. P. (1969). Tendencies of the Synoptic Tradition. Cambridge, England: Cambridge University Press. ISBN 978-0-521-07318-9. ^ Schnell, C. W. (1989). "Tendencies in the Synoptic Resurrection Tradition: Rudolf Bultmann's Legacy and an Important Christian Tradition". Neotestamentica. 23 (2): 177–194. JSTOR 43048980. ^ Sanders, E. P. (1983). Paul, the Law, and the Jewish People. Minneapolis, Minnesota: Fortress Press. ISBN 978-0-80061-878-0. ^ Long, Burke O. (1976). "Recent Field Studies in Oral Literature and their Bearing on OT Criticism". Vetus Testamentum. 26 (2): 187–198. doi:10.1163/156853376X00330. ^ Luomanen, Petri (2014). "How Religions Remember: Memory Theories in Biblical Studies and in the Cognitive Study of Religion". In Czachesz, Istvan; Uro, Risto (eds.). Mind, Morality and Magic: Cognitive Science Approaches in Biblical Studies. New York: Routledge. ISBN 978-1-84465-733-9. ^ a b Wood, Laurence W. (2005). Theology as History and Hermeneutics: A Post-Critical Conversation with Contemporary Theology. Lexington, Kentucky: Emeth Press. ISBN 978-0-97554-355-9. ^ Porter, Stanley E. (2004). The Criteria for Authenticity in Historical-Jesus Research: Previous Discussion and New Proposals. New York: T&T Clark International. ISBN 978-0-56704-360-3. ^ Harrington, Daniel J. (1990) . Interpreting the New Testament: A Practical Guide. Collegeville, Minnesota: The Liturgical Press. ISBN 978-0-8146-5124-7. ^ a b W. R. F. Browning, ed. (2004). "Redaction Criticism". Oxford Dictionary of the Bible. Oxford University Press. Retrieved 25 June 2018. ^ Quote in Soulen, Richard N.; Soulen, R. Kendall (2001). Handbook of Biblical Criticism (Third ed.). Louisville, Kentucky: Westminster John Knox Press. ISBN 978-0-664-23534-5. ^ See also Harrington, Daniel J. (1990) . Interpreting the New Testament: A Practical Guide. Collegeville, Minnesota: The Liturgical Press. ISBN 978-0-8146-5124-7. ^ a b c d Lee, Jae Hyun (2016). "Günther Bornkamm and Redaction Criticism". In Porter, Stanley E.; Adams, Sean A. (eds.). Pillars in the History of Biblical Interpretation: Prevailing Methods Before 1980. 1. Eugene, Oregon: Wipf and Stock. ISBN 978-1-4982-8761-6. ^ a b c d e House, Paul R., ed. (1992). Beyond Form Criticism: Essays in Old Testament Literary Criticism. Winona Lake, Indiana: Eisenbrauns. ISBN 978-0-931464-65-2. ^ Conrad, Edgar W. (2003). Reading the Latter Prophets: Toward a New Canonical Criticism. New York: T & T Clark. ISBN 978-0-5670-8452-1. ^ Barton, John (1996). Reading the Old Testament: Method in Biblical Study (Second ed.). Louisville, Kentucky: Westminster John Knox Press. ISBN 978-0-664-25724-8. ^ James A. Sanders (1992). "Foreward". In Wall, Robert W.; Lemcio, Eugene (eds.). The New Testament as Canon: A Reader in Canonical Criticism. Sheffield, England: T&T Clark. ISBN 978-1-85075-374-2. ^ Hayes, John H.; Holladay, Carl R. (2007). Biblical Exegesis: A Beginner's Handbook (Third ed.). Louisville: Westminster John Knox Press. ISBN 978-0-664-22775-3. ^ Williamson, H. G. M. (1990). "Review of Hearing and Speaking the Word: Selections from the Works of James Muilenberg". Journal of Semitic Studies. 35 (1): 145–146. doi:10.1093/jss/XXXV.1.145. ^ Foss, Sonja K. (2009). Rhetorical Criticism: Exploration and Practice. Long Grove, Illinois: Waveland Press. ISBN 978-1-57766-586-1. ^ Watson, D. F. (1988). "Rhetorical Criticism". In Bromiley, Geoffrey W.; Harrison, Everett F.; Harrison, Roland K.; LaSor, William Sanford; Wilson, Gerald H.; Smith Jr., Edgar W. (eds.). The International Standard Bible Encyclopedia. 4 (Q-Z). Grand Rapids, Michigan: Eerdmans. pp. 181–182. ISBN 978-0-8028-3784-4. ^ Willey, P. T. (1998). "Phyllis Trible". In McKim, Donald K. (ed.). Historical Handbook of Major Biblical Interpreters. Downers Grove, IL: InterVarsity Press. pp. 615–618. ISBN 978-0-8308-1452-7. ^ a b c d Powell, Mark Allan (1990). What is Narrative Criticism?. Minneapolis, Minnesota: Augsburg Fortress. ISBN 978-0-80060-473-8. ^ Greidanus, Sidney (1988). The Modern Preacher and the Ancient Text: Interpreting and Preaching Biblical Literature. Grand Rapids, Michigan: Eerdmans. ISBN 978-0-8028-0360-3. ^ Paris, Christopher T. (2014). Narrative Obtrusion in the Hebrew Bible. Minneapolis, Minnesota: Fortress Press. ISBN 978-1-4514-8211-9. ^ Weitzman, Steven (2007). "Before and After The Art of Biblical Narrative". Prooftexts. 27 (2): 191–210. doi:10.2979/pft.2007.27.2.191. ^ Merenlahti, Petri (2015). A Smaller God: On the Divinely Human Nature of Biblical Literature. Eugene, Oregon: Cascade Books. ISBN 978-1-62564-410-7. ^ Dunn, James (2003). Jesus Remembered. Christianity in the Making. 1. Grand Rapids, Michigan: Eerdmans. p. 339. ISBN 978-0-8028-3931-2. ^ Verhoeven, Paul; van Sheers, Rob (2010). Jesus of Nazareth. New York: Seven Stories Press. p. 39. ISBN 978-1-58322-905-7. ^ a b c d McGuckin, J.A. (2000). "Quest of the Historical Jesus". In Hastings, Adrian; Mason, Alistair; Pyper, Hugh (eds.). The Oxford Companion to Christian Thought. New York: Oxford University Press. ISBN 978-0-19-860024-4. ^ a b Theissen, Gerd; Winter, Dagmar (2002). The Quest for the Plausible Jesus: The Question of Criteria. Translated by M. Eugene Boring. Westminster John Knox Press. ISBN 978-0-664-22537-7. ^ Porter, Stanley E. (2004). Criteria for Authenticity in Historical-Jesus Research: Previous Discussion and New Proposals. New York: T & T Clark International. ISBN 978-0567043603. ^ Sanders, E. P. (1993). The Historical Figure of Jesus. New York: Penguin Books. ISBN 978-0-14014-499-4. ^ Telford, William R. (1998). "Major Trends and Interpretive Issues in the Study of Jesus". In Chilton, Bruce David; Evans, Craig Alan (eds.). Studying the Historical Jesus: Evaluations of the State of Current Research. Boston, Massachusetts: Brill. ISBN 978-90-04-11142-4. ^ a b Watt, David Harrington (2014). "Fundamentalists of the 1920s and 1930s". In Wood, Simon A.; Watt, David Harrington (eds.). Fundamentalism: Perspectives on a Contested History. Columbia, South Carolina: University of South Carolina Press. ISBN 978-1-61117-354-3. ^ a b Bendroth, M. (2017, February 27). "Christian Fundamentalism in America". Oxford Research Encyclopedia of Religion. Accessed 5 Oct. 2018. ^ a b Prior, Joseph G. (1999). The Historical Critical Method in Catholic Exegesis. Rome, Italy: Gregorian University Press. ISBN 978-88-7652-825-5. ^ a b Madigan, Kevin (2013). "Catholic Interpretation of the Bible". In Senior, Donald; Collins, John; Getty, Mary Ann (eds.). The Catholic Study Bible (Third ed.). New York: Oxford University Press. ISBN 978-0-19-026726-1. ^ Montagnes, Bernard (2006). The Story of Father Marie-Joseph Lagrange: Founder of Modern Catholic Bible Study. Translated by Benedict Viviano. New York: Paulist Press. ISBN 978-0-8091-4333-7. ^ Bea, Augustin (2011). "Sacred Scripture and the Errors of the 'New' Exegesis". In Hahn, Scott; Scott, David (eds.). For the Sake of Our Salvation: The Truth and Humility of God's Word. Steubenville, Ohio: Emmaus Road Publishing. ISBN 978-1-93101-868-5. ^ Crowe, Brandon D. (2016). "J. J. Griesbach and Karl Lachmann". In Porter, Stanley E.; Adams, Sean A. (eds.). Pillars in the History of Biblical Interpretation: Prevailing Methods before 1980. 1. Eugene, Oregon: Pickwick Publications. ISBN 978-1-4982-8761-6. ^ Norton, Gerard (2011). "Conleth J. Kearns: An Appreciation". In Kearns, Conleth (ed.). The Expanded Text of Ecclesiasticus: Its Teaching on the Future Life as a Clue to Its Origin. New York: Walter de Gruyter GmbH & Co. ISBN 978-3-11-025259-0. ^ Gilbert, Maurice (2011). "Introduction to Kearns' Dissertation". In Kearns, Conleth (ed.). The Expanded Text of Ecclesiasticus: Its Teaching on the Future Life as a Clue to Its Origin. New York: Walter de Gruyter GmbH & Co. ISBN 978-3-11-025259-0. ^ Levenson, Jon D. (1993). The Hebrew Bible, the Old Testament, and Historical Criticism: Jews and Christians in Biblical Studies. Louisville, Kentucky: Westminster John Knox Press. ISBN 978-0-664-25407-0. ^ a b c d e Schwartz, Baruch J. (2012). "The Pentateuch as Scripture and the Challenge of Biblical Criticism". In Sommer, Benjamin D. (ed.). Jewish Concepts of Scripture: A Comparative Introduction. New York: New York University Press. ISBN 978-0-8147-4062-0. ^ Horrell, David G. (1999-01-01). "Social-Scientific Interpretation of the New Testament: Retrospect and Prospect". In Horrell, David G. (ed.). Social-Scientific Approaches to New Testament Interpretation. Edinburgh, Scotland: T&T Clark. ISBN 978-0-56708-658-7. ^ Elliott, John Hall (1993). Via, Dan Otto (ed.). What is Social-Scientific Criticism?. Minneapolis, Minnesota: Fortress Press. ISBN 978-0-80062-678-5. ^ Soulen, Richard N.; Soulen, R. Kendall (2011). Handbook of Biblical Criticism (Fourth ed.). Louisville, Kentucky: Westminster John Knox. ISBN 978-0-66423-534-5. ^ a b Adam, Andrew Keith Malcolm (1995). What is Postmodern Biblical Criticism?. Minneapolis, Minnesota: Augsburg Fortress. ISBN 978-0-8006-2879-6. ^ a b Briggs, Sheila (2012). "What is Feminist Theology?". In Fulkerson, Mary McClintock; Briggs, Sheila (eds.). The Oxford Handbook of Feminist Theology. New York: Oxford University Press. ISBN 978-0-19-927388-1. ^ Fiorenza, Elisabeth Schüssler (2014). "Between Movement and Academy: Feminist Biblical Studies in the Twentieth Century". In Fiorenza, Elisabeth Schüssler (ed.). Feminist Biblical Studies in the 20th Century: Scholarship and Movement. Atlanta, Georgia: Society of Biblical Literature. ISBN 978-1-58983-922-9. ^ Jobling, J'annine (2018). Feminist Biblical Interpretation in Theological Context: Restless Readings. New York: Routledge. ISBN 978-1-13873-389-3. ^ Davies, Eryl W. (2013). Biblical Criticism: A Guide for the Perplexed. New York: Bloomsbury. ISBN 978-0-567-03793-0. ^ a b c Comstock, Gary (1986). "Truth or Meaning: Ricoeur versus Frei on Biblical Narrative". The Journal of Religion. 66 (2): 117–140. doi:10.1086/487357. JSTOR 1202583. ^ a b Rollins, Wayne (1999). Soul and Psyche: The Bible in Psychological Perspective. Minneapolis, Minnesota: Fortress Press. ISBN 978-0-8006-2716-4. ^ Kille, D. Andrew (2001). Psychological Biblical Criticism. Minneapolis, Minnesota: Fortress Press. ISBN 978-0-80063-246-5. Frei, Hans (1974). The Eclipse of Biblical Narrative: A Study in Eighteenth and Nineteenth Century Hermeneutics. New Haven, Connecticut): Yale University Press. David J. A. Clines, "Possibilities and Priorities of Biblical Interpretation in an International Perspective", in On the Way to the Postmodern: Old Testament Essays 1967–1998, Volume 1, (JSOTSup, 292; Sheffield: Sheffield Academic Press, 1998), pp. 46–67 See Section 6, Future Trends in Biblical Interpretation, overview of some current trends in biblical criticism. Philip Davies, review of John J. Collins, "The Bible after Babel: Historical Criticism in a Postmodern Age", 2005 Reviews a survey of postmodernist biblical criticism. Allen P. Ross (Beeson Divinity School, Samford University), "The Study of Textual Criticism" Guide to the methodology of textual criticism. Yair Hoffman, review of Marvin A. Sweeney and Ehud Ben Zvi (eds. ), The Changing Face of Form-Criticism for the Twenty-First Century, 2003 Discusses contemporary form criticism.